The Importance of Public Transportation. Public transportation provides people with mobility and access to employment, community resources, medical care, and recreational opportunities in communities across America. It benefits those who choose to ride, as well as those who have no other choice: over 90 percent of public assistance recipients do not own a car and must rely on public transportation. Public transit provides a basic mobility service to these persons and to all others without access to a car. Public transportation is an important contributing factor to urban sustainability. Effective transportation networks that incorporate public transit help lower a city’s per capita carbon footprint, and make cities more livable by easing commute and transportation needs and increasing accessibility. But the mere presence of public transportation—the number of buses, trains, trolleys, and trams available—does not paint a complete picture. 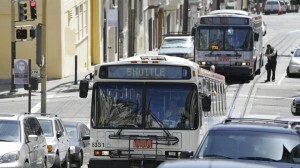 The Sustainable Cities Institute names five principles of sustainability for municipal transportation: accessibility; affordability; connectivity; holistic transportation and land use planning; and planning with the environment in mind. Start-ups are proving more efficient than government in areas like transportation. Should some services be privatized? Cities such as New York and San Francisco have extensive public-transportation systems that carry millions of residents by bus, train, boat, and light rail. But in recent years, there’s been an expanding fleet of private vehicles too: Lyft, Uber, Juno, Uber Pool, and the Google Bus, to name a few. These offerings give commuters more choices, but may also undermine the public services available. They raise fundamental questions about the future of how people will get around cities. I used to think these services were just for the rich—a friend of mine who lived in New York insisted on taking an Uber Pool to work every day because he said it was a much better experience than public transit. But as the options increase, they carry an expanding array of people. 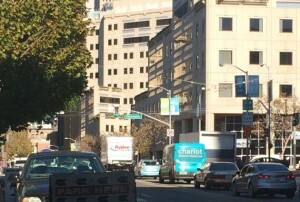 This morning, for instance, I walked one block from my house to take a private van service called Chariot to my office in San Francisco. Before Chariot, this commute took at least 40 minutes and consisted of riding a bus to the subway to another bus. Chariot—a shared van service run by a private company—brought me directly from my house to my office in just over 20 minutes. And it cost roughly the same price as the lengthier public transit option. Why should anyone use public services if the private sector can provide the same service more efficiently? Many economists would say that giving consumers more options is a good thing. And yet, even with all the subsidies and regulatory help, most public transit systems have trouble staying afloat. New York City’s Metropolitan Transportation Authority, for example, has more than 6 million daily riders and a $15 billion budget, and is still constantly in crisis. The private sector creates some losers, too, though. Chariot doesn’t serve many of the poorer neighborhoods in San Francisco, for example. (A spokesperson for Chariot says its routes are crowdsourced, and thus chosen by its users.) And the service is only accessible to people with smartphones who commute during the morning and evening rush. This means that low-income people, who already have limited access to transit, can’t use the service to get to work as quickly as wealthier people can, even though they are the ones that often need reliable transportation even more, since their work schedules are less flexible. But the private sector doesn’t have to completely replace government services. Sometimes they can work together.